Dubai, UAE, November 21, 2018: Joining with the people of the United Arab Emirates as they celebrate their 47th National Day, Roger Dubuis, the pioneer of contemporary skeleton calibres, introduces an exclusive UAE Limited Edition Excalibur Spider Skeleton, dedicated to the people and leadership of the nation. 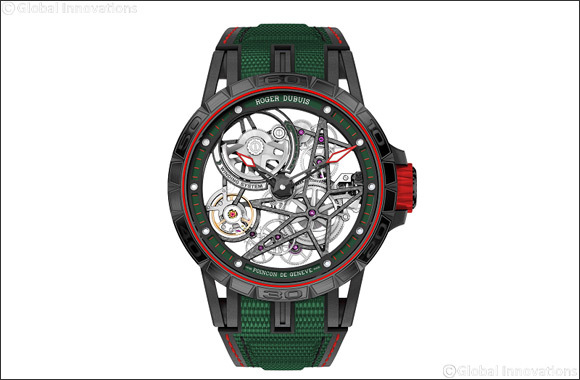 Issued in only 28 pieces, the UAE Limited Edition is decked out in the red, green, white and black colours of the UAE flag and features the in-house movement RD820SQ, a demonstration of the Manufacture’s expertise of architectural and technical mechanics, stamped with the prestigious Poin�on de Gen�ve. The automatic movement is highlighted by the astral skeleton structure and the micro‑rotor, offering a spectacular view on the mechanism. Not only aesthetics, the micro‑rotor offers a winding ratio as good as the best single‑direction big oscillating weight. This exceptional edition has been personalised with the mark of all Roger Dubuis contemporary skeleton movements: the black skeleton dial, the star-shaped bridge and rhodium plated indexes filled with white luminous SLN. The green strap is adorned with red stitching, all details proudly representing the national colours of the UAE flag. 'We want to honour the spirit of the United Arab Emirates, a nation that has already accomplished amazing achievements; thanks to its visionary leaders, inspiring generations of successful citizens. The Roger Dubuis Excalibur UAE Limited Edition is a tribute to this mind-set. We look forward to celebrating the 47th UAE National Day on December 2nd “. Said Jean-Sebastien BERLAND, Regional Brand Director, Roger Dubuis.